Turn a single RJ45 Phone outlet into two with this modular adapter. 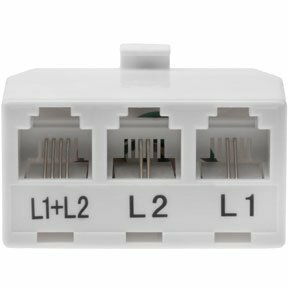 Input 1 x RJ45-Male. Output 2 x RJ45-Female. Turn a single RJ45 Phone outlet into two with this modular adapter. Input 1 x RJ45-Female. Output 2 x RJ45-Female. T adapters facilitate multiple telephone connections at one go. Like all other telephone accessories, SF Cable stock a good range of T-adapters as well. You can check the specifications and select for the one(s) that fulfills your requirements. You can go for RJ11 6P4C 1 M/ 2F Modular T Adapters, RJ11 6P4C 1 F/ 2F Modular T Adapters, RJ11 6P4C 1 M/ 3F Modular T Adapters, RJ12 6P6C 1 M/ 2F Modular T Adapters, RJ45 8P8C 1 M/ 2F Modular T Adapters, RJ45 8P8C 1 F/ 2F Modular T Adapters, or RJ12 1F/2F T adapter, Reverse (Pin1-Pin6). All our products are RoHS compliant and environment friendly as well. Moreover, you get all the products at very competitive prices.